Cantoalegre has been characterized throughout its history for its shows, concerts and special assemblies. 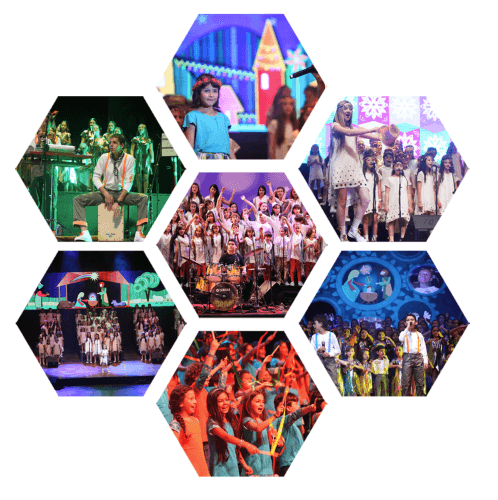 In addition, the musical education for children and youth has been a hallmark that has left an imprint in many generations who remember their involvement and journey with Cantoalegre as their best years. In addition to its traditional concerts as La Tierra es la casa de todos (Earth is everyone's home), Cantar y jugar (Sing and play), Agua pasó por aquí (Water passed through here), Los niños tienen la palabra (Children have their say), Un, dos, tres, por mí (One, two, three for me), Había una vez (Once upon a time), among others, Christmas has been a very important festivity for Cantoalegre. Through the years we have found new ways to celebrate this season with different sounds and themes, bringing traditional songs, adaptations, translations and even new songs created especially for our productions.